Rally Australia is pushing forward on a plan for a Sydney component in 2019 with discussions set to continue this week. The Coffs Harbour event which hosted the final round of the World Rally Championship on the weekend has faced calls from teams to relocate the rally nearer to a metropolis, namely Sydney, to boost attendances. 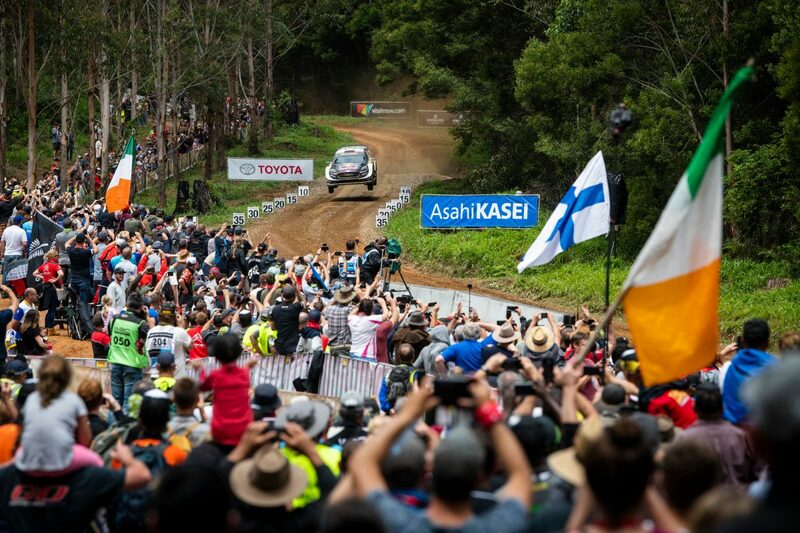 Compared to rival rallies, Australia has struggled on crowd figures although this year’s title decider on the Coffs Coast attracted a significant rise in spectator numbers helped by a thrilling championship battle. Organisers announced a four-day crowd figure of 83,155 for the event, which is more than 20,000 more than last year. Despite concerns surrounding its future, a new one-year contract extension has been agreed for the event to remain in Coffs Harbour next year. However, Rally Australia organisers are keen to improve the round and will continue to evaluate plans to run as many as two stages in and around the New South Wales capital. Several sites have already been earmarked for potential stages although such a development would require backing from New South Wales Government. WRC Promoter and the FIA are across the concept which will be discussed this week. “We’d like to do a Sydney component,” Rally Australia Chairman Ben Rainsford told Speedcafe.com. “We talk about it. From an audience point of view it is super desirable. From a logistics and bureaucratic point of view it is almost impossible. “We would need to have our partners in New South Wales Government to be a part of that because there would be some bureaucracy that we would need to address in doing it. “The logistics side the staff here already have a plan about how they would active that and the FIA and promoter are across all of that. “It is still being discussed; I will let the staff digest this year’s event but they will be down in Sydney next week and they will start that process straight away. “The fact finding missions have already been done and they have got three or four sites there. Rainsford says the ideal situation would be to run a Super Special in the heart of Sydney taking in key landmarks such as the Opera House and Harbour Bridge, alongside a competitive stage on the outskirts of the city. “I think we would like to do at least a stage down there and perhaps a competitive stage as opposed to a Super Special stage, but do it so the teams are not facing the burden of moving an entire service park down there, which would probably be cost prohibitive,” Rainsford added. “I’d like for it to be more than a Super Special stage but again that is harder and Sydney is very populated metropolis and to find a clear section of road that is compliant would be hard. While the evaluation of a Sydney component is set to continue, Rainsford believes it is not pivotal for the event’s future as it plans to ensure the rally remains on the calendar beyond 2019. “I’ve got mixed thoughts about it. Certainly Hyundai would like to see us in a larger metropolis,” noted Rainsford. “We are mindful of the fact that we are confined in Coffs by the demographic so we invest rather significantly in our social media and we lead the world in that by a long way. “It is not just a number but the engagement and fan base we have got there. We are seeing more and more that our partners latch onto that. “The focus is well and truly on 2020 and 2021 and we know we need to keep delivering good outcomes there because there are a number of events that are hovering for a slot. Sebastien Ogier claimed a sixth world title at Coffs Harbour on Sunday while Jari-Matti Latvala won the rally for Toyota.